As 2011 rapidly shapes up to become The Year of Supply Chain Sustainability, few industries better illustrate the challenges and opportunities presented by the issue than IT. Prodded by looming legislation to rapidly get up to speed on where and how their materials are sourced, IT firms are now leading the pack in reporting the social and/or environmental performance of their supply chains at granular levels of detail. At least, some of the are. That's according to a study published today of 26 IT companies by Det Norsk Veritas (DNV), where four firms -- HP, Apple, Intel and Motorola -- are ranked the best firms managing their supply chains for social, environmental and "emerging issues" areas. The study looked at 26 companies in the IT industry, each of which submitted Global Reporting Initiative (GRI)-compliant sustainability reports detailing their supply chain activity. Fourteen of those companies were members of the Electronics Industry Citizenship Coalition (EICC), an industry trade group dedicated to social and environmental responsibility. 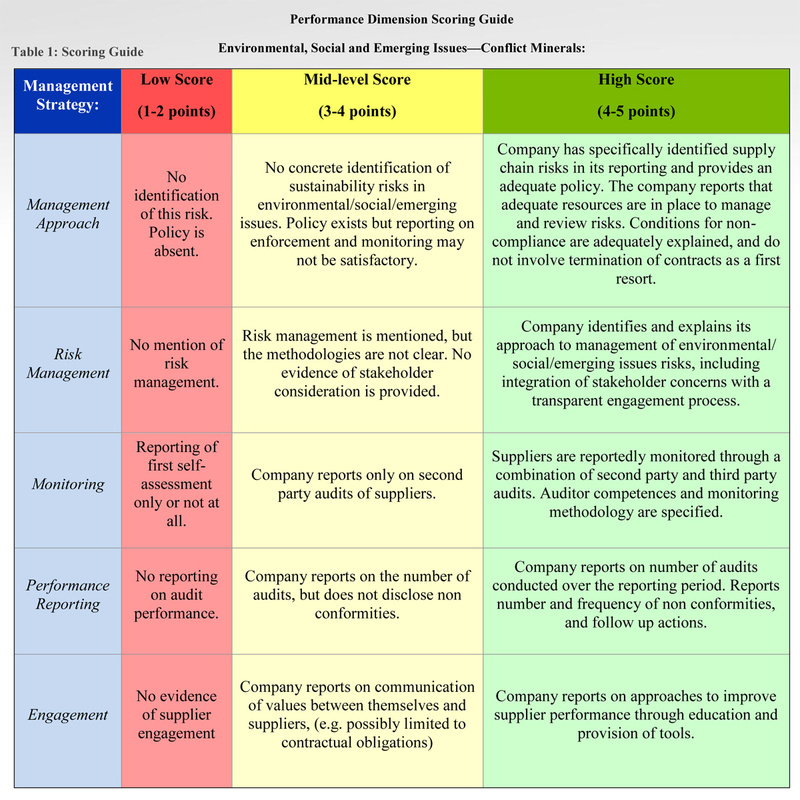 Companies earned a score ranging from one to six across social, environmental and emerging issues areas (which for the IT industry can be shorthanded to the ongoing conflict minerals discussion) in five management categories: Management Approach, Risk Management, Monitoring, Performance Reporting and Engagement. A maximum score of 90 was possible; the average score was 39.1, while the four leading firms scored dramatically higher: HP led the pack with 76, Apple with 73, Intel with 71, and Motorola with 63. DNV's report does not include full rankings -- simply a general breakdown of how many companies earned high, middle or low scores -- because these firms are already among the leaders in the industry simply by their participation in GRI-compliant sustainability reporting. Instead, this report is intended as a way to help companies across any industry get up to speed on supply chain management issues. "We hope to encourage all companies to thoughtfully and intentionally develop a supplier reporting strategy that considers sustainability criteria material to their supply chain operations," Natasha D'Silva, a consultant in DNV's Sustainability and Innovation practice, explained in an email interview. "As such, we are excited to engage in conversations with the companies themselves about their strengths and where specific opportunities for improvement lie in their supply chain reporting, but we will not be publicly releasing the scores of each company." The highest scores achieved in Social performance dimension and lowest scores in Emerging Issues / Conflict Minerals. Performance Reporting is the management strategy element with greatest potential for improvement, whereas Management Approach is the element with which companies are most comfortable. It's perhaps unsurprising that emerging issues remain the least-addressed. But with the Dodd-Frank financial reform bill about to go into effect, with its requirement that all companies certify that they're not sourcing "conflict minerals" from the war-torn Democratic Republic of Congo, these emerging issues will move front-and-center very soon. Next page: Five recommendations for any company to get up to speed. At the same time, the complex issue of conflict minerals simply can't be addressed by a single company. That's one of the reasons why EICC members scored higher on average than other firms in the report, D'Silva explained. "Industry work groups such as the EICC and the GeSI initiative develop common industry practices," she wrote. "However, companies that have developed and communicated a supplier code-of-conduct and that have mapped risks in their own supply chains, identifying suppliers that are using conflict minerals are at an advantage when it comes to developing a comprehensive management and reporting strategy." They reported working closely with their supplier management teams during the audit process and developing key performance indicators that connected incentives and recognition to strong performance as a means of encouraging ownership of sustainability performance in supplier facilities (which is of particular importance when vulnerable suppliers have been identified). Also, simply, top performers made their data, the good and the bad, easy to access and presented it in a way that allows readers the ability to compare performance over time and against peers. Placing information in a single portal allows the great number of stakeholders interested in a company's performance to find the information necessary for their decision-making. Given that there is room for improvement across the board, even in leading companies, the report's authors have put together five recommendations that can not only help IT companies pick up the pace on managing their supply chain, but that can be applied to any firm with a broad network of suppliers. Develop an integrated approach to all three performance dimensions. Establish, measure and report on qualitative and quantitative performance indicators based on risk and opportunity mapping. Build internal capacity to manage conflict minerals. Improve ease of access to information related to sustainability reporting. The full report, "The Clear Links Report: Unlocking Value through Best Practice in Sustainable Supply Chain Reporting," is available for download from GreenBiz.com. China Clean Room photo via Shutterstock. Why aren't more tech companies tracking conflict minerals? One Step Forward for Conflict Minerals, but What Impact on Congo?